The high-performance sewing thread made of 100% of a politetraftoretilen (PTFE) offers Coats Helios P excellent chemical, warm and viscous resistance. Coats Helios P is suitable for use in production of external goods, such as canopies, boat covers and others which are exposed to severe atmospheric conditions (ultraviolet rays, a rain, salty water and another). Unique Coats Helios P properties do it by the excellent decision for responsible application of a filtration. Coats Helios P is developed with an internal power. It is the strongest PTFE the sewing thread made to mark value that the thinnest sizes of a label can be used to reduce the total cost. Coats Helios P guarantees the full protective atmosphere against chemical attacks. She guarantees the full resistance of destruction by ultraviolet. 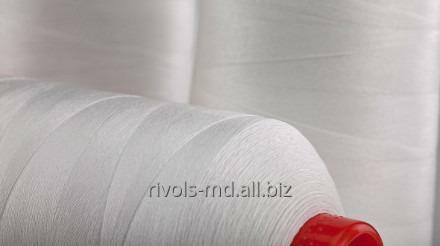 Coats Dabond is the complex bondirovanny twisted thread from polyester fibers with excellent UF-stability and resistance to attrition which is specially developed for severe weather conditions; it is ideal for any conditions of external application, including assuming influence of sea water and a sunlight. Coats Helios K is the hi-tech sewing thread executed from a special steel core (material 1.4841 brand) with 10 steel threads with a braid from para-aramide fiber. Coats Helios is the hi-tech sewing thread consisting of a steel core (brand of steel 1.4301 or AISI 304) from 8-10 by steel threads with a braid from fire-resistant cotton. In view of the fact that the possibility of application of this or that thread more depends on conditions of final use of finished product, the customer should hold preliminary testing to be convinced that the picked-up thread applicable for this type of a product. The technical information given above is based on average values and can be used only as approximate. Unbelievable price on The high-performance sewing thread made of 100% of a politetraftoretilen of Coats Helios P in Chişinău (Moldova) company Rivols, SRL.